There is a long tradition of research on politics, power and exclusion in areas such as sociology, social policy, politics, women’s studies and philosophy. While power has received considerable attention in mainstream management research and teaching, it is rarely considered in terms of politics and exclusion, particularly where the work of women writers is concerned. 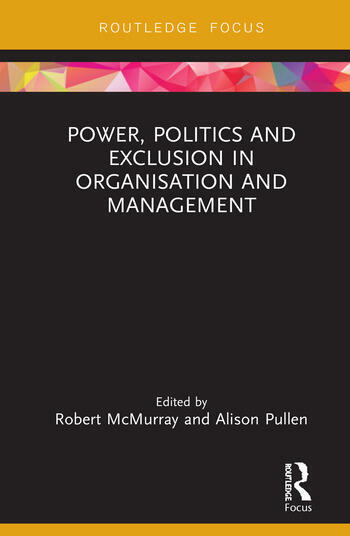 This second book in the Routledge Series on Women Writers in Organisation Studies analyses the ways in which women have theorised and embodied relations of power. Women like Edith Garrud who, trained in the Japanese art of jujutsu, confronted the power of the state to champion feminist politics. Others such as Beatrice Webb and Alva Myrdal are shown to have been at the heart of welfare reforms and social justice movements that responded to the worst excesses of industrialization based on considerations of class and gender. The writing of bell hooks provides a necessarily uncomfortable account of the ways in which imperialism, white supremacy and patriarchy inflict unspoken harm, while Hannah Arendt is shown to consider the ways in which different modes of organising restrict the ability of people to live freely. Taken together such writing dispels the myth that work or business can be separated from the rest of life, a point driven home by Rosabeth Moss Kanter’s observations on the ways in which power and inequality differentially structure life chances. These writers challenge us to think again about power, politics and exclusion in organisational contexts. Taken together each women writer and their authors provide provocative thinking which opens up new avenues for organization theory, practice and social activism. Each Women Writer is introduced and analysed by experts in organization studies. Further reading and accessible resources are also identified for those interested in knowing (thinking!) more. This book will be relevant to students, researchers and practitioners with an interest in business and management, organizational studies, critical management studies, gender studies and sociology. Like all the books in this series, it will also be interest to anyone who wants to see, think and act differently. Robert McMurray is Professor of Work and Organisation at The York Management School, UK. Research interests include the organisation of health care, professions, emotion labour, dirty work and visual methods. Other collaborative book projects include The Dark Side of Emotional Labour (Routledge) The Management of Wicked Problems in Health and Social Care (Routledge) and Urban Portraits. Alison Pullen is Professor of Management and Organization Studies at Macquarie University, Australia and Editor-in-Chief of Gender, Work and Organization. Alison’s research has been concerned with analyzing and intervening in the politics of work as it concerns gender discrimination, identity politics, and organizational injustice.